Why choose Dunlop Sport BluResponse? Anyone looking to buy a car tyre will want features like shorter braking distance, lower tyre noise, great riding comfort and safety. You will get all these features and many more from the Dunlop Sport BluResponse. These tyres are known for wet and dry handling characteristics, dry braking and aquaplaning. These summer tyres from Dunlop are designed to offer very good driving performance. This is possible through the high quality silica compound and the unique design of the tyre. The tyre features a special polymer compound with large central grooves to ensure better handling and grip on the wet roads and also to repel away the water quickly. The rolling resistance of this tyre is greatly reduced with the use of low-heat compound and its aerodynamic shape. This will help in saving fuel. The shoulder grooves are closed and there by noise emissions are very less. A joint less belt design is put to use through hybrid-overlay technology to ensure great stability at high speeds and even wear and tear. 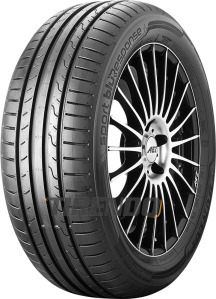 The tyre is offered to suit 15” wheel and has dimensions of 185 in width and 60 height profile. The Dunlop Sport BluResponse offers a maximum weight index rating of 84 and its speed index rating is H. This means that this tyre can travel at a maximum speed of 130 mph. The tyres can be bought online at Tirendo.co.uk and they carry an EU tyre rating of A to C fuel efficiency, A to C wet grip and noise levels of 66 to 70 dB.